The Doctor isn’t in the business of fighting gods. He confronts what more primitive people think of as gods, and he reveals the rational truth lurking underneath. Admittedly, that’s rational in Time Lord terms rather than human, so “rational” can stretch to include otherworldly monsters like soul vampires. As he suggests in his big, climactic monologue, the Doctor’s knowledge is vast, but it’s finite. While he’s met some god-like beings in his time, most of them turn out to be rather less omnipotent than they claim to be. As the Doctor tells Merry, the creature inside the box might be capable of devouring her soul, but it didn’t create her, and it can’t claim any special cosmic right to that prize. In all his lives, the Doctor has reveled in tearing down false deities, and while it’s unquestionably noble and heroic to free people from oppression, there’s also a paternalistic component to the Doctor’s actions. When the Doctor describes the beliefs of the peoples of Akhaten as “a nice story,” he speaks like an indulgent parent allowing his children to remain in ignorance because he knows they are happier that way. The big selling point for “The Rings Of Akhaten” is the sheer spectacle of all the aliens on display. There are at least a half-dozen distinct alien races and more than 50 individual aliens in the crowd scenes. Modern Doctor Who has portrayed alien gatherings before—most notably in its second episode back, “The End Of The World”—but it’s never attempted anything on this sort of scale; this might actually be the show’s most ambitious portrayal of an alien world since “The Web Planet” way back in 1965. Much like Doctor Who stories will famously film the Doctor and his companion endlessly walking around one short corridor to create the illusion of a massive underground complex, previous alien-focused episodes like “Gridlock” or “Voyage Of The Damned” were carefully organized so that only a few prosthetics-heavy actors had to appear together in any one scene, and there were plenty of characters identical to regular humans around to fill out the numbers. “The Rings Of Akhaten” does not allow itself that last luxury; Matt Smith and Jenna-Louise Coleman are the only cast members not wearing any facial prosthetics. The new Doctor Who might have a budget that dwarfs that of its predecessor, but the show still has to cheat around its only financial limitations on a weekly basis. We’re so used to Doctor Who creating the illusion of depth and scale through dialogue and CGI that it’s easy to miss just how impressive the marketplace and recital scenes actually are. Admittedly, the episode’s depiction of the alien planets isn’t an unqualified triumph. As showrunner Steven Moffat has explained, “The Rings Of Akhaten” tries to create a world completely inside the studio that can stand alongside the foreign location shoots for “A Town Called Mercy” and “The Angels Take Manhattan.” That requires the Doctor and Clara to interact with a bunch of CGI backgrounds; while the scene in which the Doctor confronts the old god is perfectly staged and lighted to sell the notion that the Doctor stands before a huge cosmic vista, the scenes where the Doctor and Clara zoom through space on an Akhaten moped are far less convincing. But beyond the special effects, “The Rings Of Akhaten” struggles to keep all its alien story elements straight. The hierarchy writer Neil Cross devises for this episode is fiendishly complex: there’s the Queen of Years, but she’s supported by a singing priest class with their own apparent tradition of unbroken lineages, and these all live in fear of the Vigil, who serve Grandfather who sleeps in the box, but Grandfather is just an alarm clock for the real old god who lives inside the planet, or maybe is the planet. The Queen’s singing on one planet is meant to keep Grandfather asleep on the next planet, but Grandfather activates his own beacon that sends the message back to the center of the system that it’s time for the Old God to awake. Also, characters seem to keep disintegrating themselves when they are no longer relevant to the plot. It’s just about possible to follow all this, but it all seems far more convoluted than it really needs to be. Akhaten works in its initial scenes, when it’s an amazing cosmic vista for the Doctor to show Clara, a bustling marketplace for the pair to explore, and a hiding spot for a scared little girl whom Clara promises to protect. And for all the baroque plotting of the middle section, there are still plenty of individual moments that work well; for instance, the Vigil’s one little scene, in which they hunt for the Queen of Years while she and Clara hide in a corner, is a wonderfully unnerving little scene, a reminder that Doctor Who can still create scary one-off monsters when it wants to. But the Vigil doesn’t get a chance to build on their initial creepiness, as they next appear as henchmen for the soul vampire. The narrative justification for this messy storytelling is to keep the Doctor off-balance, setting up what he calls his tactical booboo. Just when it appears that the Doctor has defeated another two-bit monster masquerading as a deity, an actual old god shows up, and it’s the size of a damn planet. For once, the Doctor is utterly outmatched, and he’s scared in a way he so rarely is. The Doctor can show fear, but usually only when his companion or one of his newfound friends is under immediate threat; he rarely displays such obvious terror at an adversary’s mere existence. “The Rings Of Akhaten” takes a weird, circuitous route to its climax, but the Doctor’s big speech to the god packs a wallop. That’s partially down to Matt Smith’s performance, who throughout the episode emphasizes the ancient and alien sides of the Doctor, conveying over a thousand years of wonder and loneliness. Implicit in his decision to sacrifice himself to the old god is the idea that he has lived too long and seen too much, things even that would be too much for even a god to bear. The monologue functions on a meta level as an homage to the show’s huge, 50-year past, but the speech works in the context of the scene. This god might be beyond even the Doctor’s comprehension, but he’s still trying to figure out the rules that govern this creature’s experience. He realizes that any supposed deity that demands stories from its worshippers is effectively a parasite, a being that must live vicariously through the actual experiences of others. And that gives the Doctor an advantage, because nobody has a bigger, more complicated story than he does. Then again, it’s Clara who really saves the day, as she uses her parents’ leaf as a symbol of all the days her mother should have lived but never was able to. The Doctor’s monologue shifts from tearful to triumphant, as he points out that even a god would have trouble devouring infinite probabilities. Clara is well-served by “The Rings Of Akhaten”—for all its narrative hiccups, the episode gets its two protagonists exactly right. The episode reveals her backstory and her own moral code, which it seems is naturally in sync with the Doctor’s. A key convention of modern Doctor Who is the Doctor doesn’t just choose anybody to be his companion, that there’s always a deeper reason. And while that often takes the form of some grand mystery—as with Clara’s impossible triple life—that also means the companion needs to react to injustice much as the Doctor does. Clara gets an extended scene without the Doctor in which she comforts the Queen of Years, explaining that she simply saw a frightened little girl and wanted to help. Clara promises Merry that everything will be all right, much as the Doctor does later, and both come dangerously close to failing this little girl when confronted by the old god. But the Doctor doesn’t shirk his self-declared responsibilities to the universe, and in Clara, he’s once again found a friend who will never walk away either. Now he just has to figure out who—or what—she actually is. Again, Neil Cross’ script for “The Rings Of Akhaten” generally offers enough cool little moments to make up for the plot deficiencies. The episode is particularly effective at dealing obliquely with the mystery surrounding Clara, as both her father’s monologue about the leaf and the Doctor’s speech to Merry about how her death wouldn’t be a sacrifice are both built around the idea that everything in the universe is unique and requires an unimaginably complex combination of factors to even happen in the first place—the Doctor’s monologue is particularly good, as it articulates the character’s longstanding commitment to preserving life in a way I’d never quite heard before. But there’s rich dramatic irony in the fact that Clara rather pointedly isn’t unique, and consequently the deaths of her past and future counterparts haven’t meant as much as they should. Clara also shows she won’t be manipulated by the Doctor when she suddenly remembers him lurking around her mother’s cemetery. It would have been reasonable for her to abandon the Doctor right then and there, honestly, but she manages to extract at least some of truth from him. 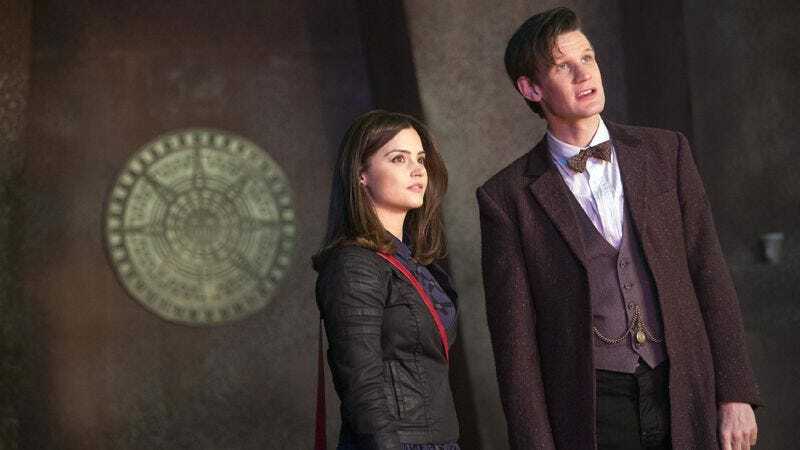 She also declares that she won’t try to replace a ghost, a line that specifically refers to Oswin and the Victorian Clara but could just as easily refer to Clara replacing Amy, or more generally the challenge faced by any new character replacing a longtime Doctor Who companion. 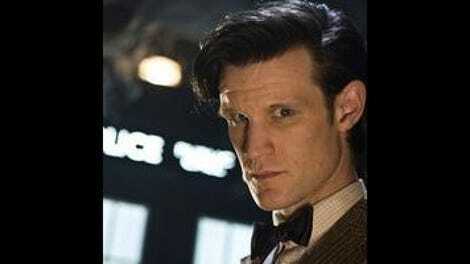 Anyone else notice the tear streaming across Matt Smith’s face during his big final monologue? I missed that on the first watch, but I didn’t miss the emotions underlying the tear. Insane, Obviously Wrong Theory Corner: Clara’s mother is the real key to all this, and her (and Clara’s) use of the phrase “Oh my stars” is a clue to the mother’s past as an intergalactic alien explorer, one who may or may not specialize in strategic leaf detachment. Actually, the very first bit of that might not be totally crazy, although I’m guessing Clara’s mother matters a whole lot more in character terms for Clara than she does as part of some vast mystery. I called the Doctor “paternalistic,” but he’s not quite like a parent, at least not exactly. Instead, it’s hard not to make a connection between a god referred to as Grandfather and the episode’s allusion to the Doctor’s original companion Susan, who always referred to William Hartnell’s Doctor as “grandfather.” The Doctor is the entire universe’s grandfather, and he embodies that role particularly well in this episode. Let me throw this question out to you — what is the most powerful god-like being the Doctor has ever faced? The Black Guardian seems like the obvious contender, although Fenric, the Beast, and even the Celestial Toymaker are possibilities. Then there’s Sutekh, although I think he was technically more of a ridiculously overpowed alien with delusions of godhood than an actual god.